In my experience, there are two main roles that is fulfilled by a head judge at Koi shows: first is to facilitate the method as to how the Koi are going to be judged and second is to act as a “tie-breaker” or a final decision maker when there are differing opinions between the judges. The styles are truly different and if you aren’t familiar with the Shinkokai method of judging, it could feel a lot like jumping into an ice cold pool. Since my dad has had prior experience in both the Japanese and American style, he was able to ease everyone into the experience with the least amount of impact. He concurred with the decision and once again asked them to select among the five which one they would rank as the best fish and the second best fish, leaving it to his fellow judges to first submit their choices. Everyone had ranked the top two Koi the same way, to which my dad replied that he once again agreed with their decision. After they had decided on the top two Koi, they proceeded to break into groups to judge all the rest of the size classes from size one onward. 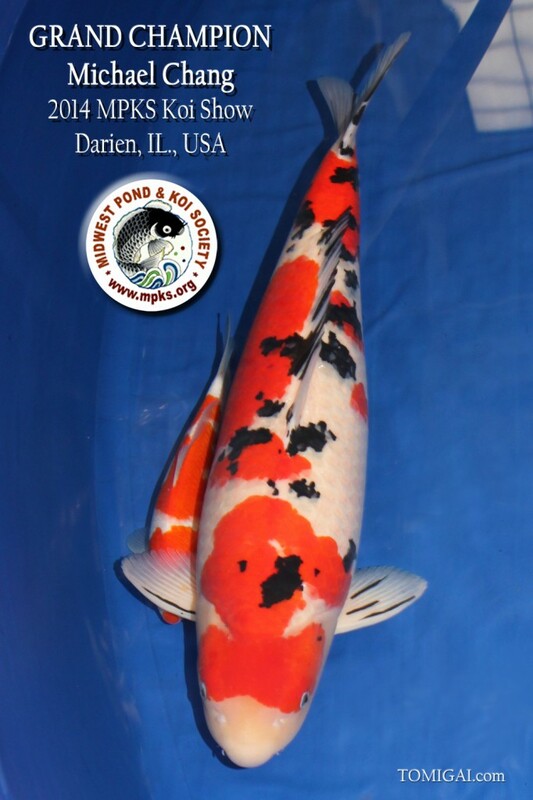 I’ve found that there are times where we can talk ourselves out of a beautiful Koi, and conversely we can convince ourselves that a Koi is better than it appears. I am guilty as well of second-guessing myself, especially when I stare too long at several different Koi when trying to decide which is the better Koi by trying too hard to analyze and deconstruct the fish. 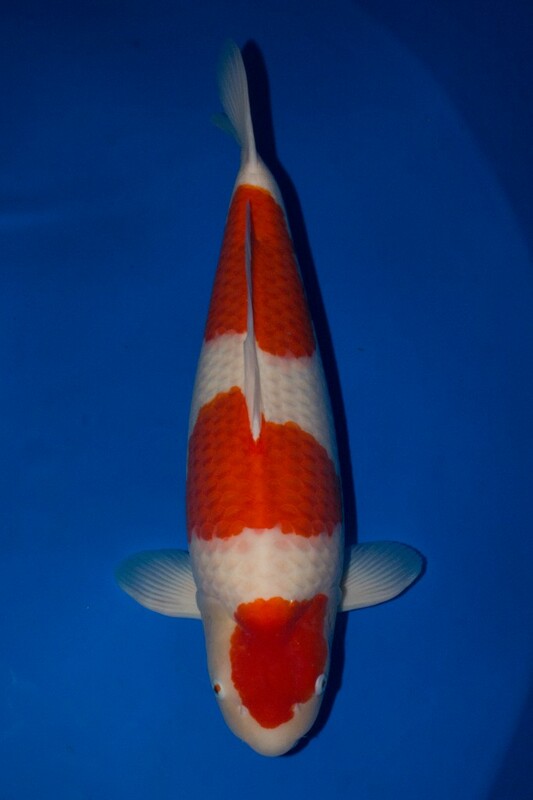 Judging koi can be daunting and at times even nerve-wracking, but what I feel is most important is the appreciation of the Koi for it’s beauty rather than it’s shortcomings. 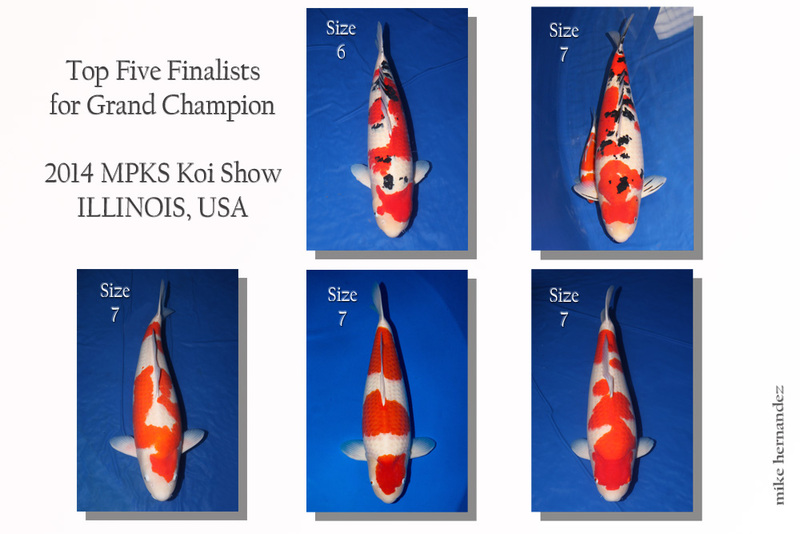 The top five Koi nominated for Grand Champion are quite beautiful and are without a doubt the five best Koi of the show for the day. Each deserves praise and acknowledgement, but as all competitions go, there can only be one Grand Champion. So, what makes these two the finer Nishikigoi? Something to ponder…. Oops, all images are in one. I mean the Kohaku bottom right. We’ve never done it this way before (select GC first). When Mike suggested we try it, I hesitated at first, but thought what the heck. why not? Because the computer program is set up for a move-up system resulting in GC selected at the end, I asked the judges to just keep it to themselves. It is an exciting a fresh approach to the process and one which I will consider using in the future.